For our first event at this venue and with a competing event across campus, we had an overwhelming success with over 100 scientists in attendance. Look for us again this fall. Thanks to everyone for making this such as strong event in this beautiful facility. 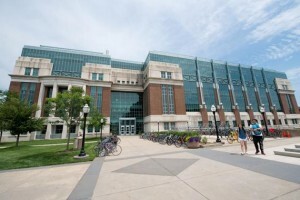 Opened in 2013, the University of Minnesota Cancer and Cardiovascular Research Building is the latest addition to the Biomedical Discovery District. Researchers in this building focus on fighting heart disease and finding cures for cancer. From the Lillehei Heart Institute and the Department of Integrative Biology and Physiology, researchers continue their work in cardiac regeneration, cardiac development, muscular dystrophy, congenital heart medicine and genomics. Space is limited at this venue.